Do you remember that contract Amazon (nearly) had with the US State Dept to sell them Kindles? I lampooned the story a couple months back, and the contract got a lot if attention. U.S. Department of State solicitation (Request for Proposals) SAQMMA12R0272 for Amazon e-Readers, Content Management, and Logistics is cancelled and the Justification and Approval (J&A) to award contract SAQMMA12D0131 on a sole-source basis is withdrawn. The Department of State intends to conduct additional market research and re-examine its requirements for this program. I am still waiting to hear back from the State Dept, but I think I know why it happened. Update: I received the official response; it's at the end of this post. The story about the contract did get a lot of attention at the time, but it's been long enough that I think a refresher is in order. This contract was quite a showy story because it looked like Amazon was being handed a deal without anyone getting a chance to bid. The contract offer was worth about 16.5 million dollars over 5 years for Amazon to supplysome 5 thousand or more Kindles to be used in US embassies around the world. While that is chump change to both Amazon and the US Govt it still has a cachet to it. The contract offer which was published by the State Dept specified all sorts of features (including some based on rumors about the next Kindle) and specifically justified offering the contract only to Amazon because no one else could offer the distribution, tech support, repair service, format support, and accessibility which Amazon could offer. And it's that last item which could be the reason that the State Department changed their mind. You see, while almost no ereader maker could match the full breadth of Amazon's features, there was at least one who thought they could meet the all-important accessibility requirement, and they got a little annoyed when they didn't get a chance to event try. A few weeks back I came across a report of a complaint filed by K-NFB. This is the company who developed Blio, and they protested the contract offer in the U.S. Court of Federal Claims. That report is behind a paywall, unfortunately, and I'm not sure exactly how it was resolved, but it does suggest that a pretty good reason for the State Dept to back down. In spite of what K-NFB claimed in the complaint, I know that they could not have matched the contract terms item for item. Some of the clauses mentioned abilities that only Amazon had (like supporting the Kindle format). But that's not such a big deal, especially considering that not even Amazon could have fulfilled the clauses which were based on rumored future Kindles. So I guess this means the contract is dead. The State Dept has said that they plan to do more research and reconsider the program requirements. It almost makes you wonder how much pressure the State Dept got behind the scenes, doesn't it? Amazon is not terribly popular in digital publishing, so it wouldn't surprise me to learn that several publishers as well as Amazon's competitors had started lobbying against the contract. The Department of State continues to pursue technology that enhances our ability to provide international audiences with relevant, real-time content on U.S. society, culture, and English language learning. 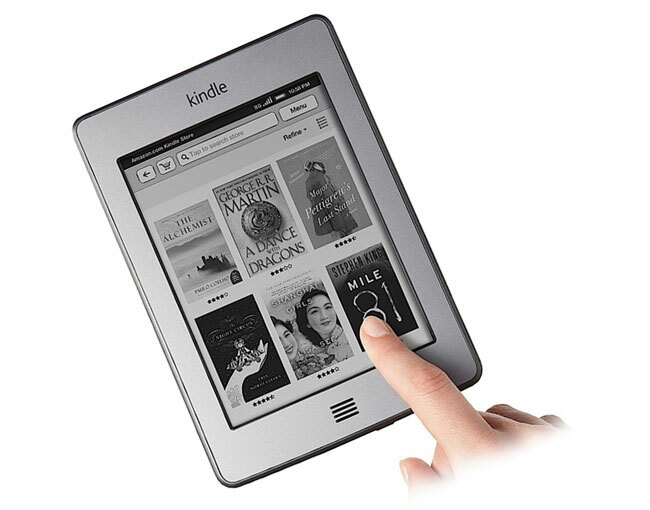 In order to conduct additional market research and further explore technological options for our public diplomacy programs, the Department of State opted on August 15 to end the Request for Proposals for the Amazon Kindle in favor of proceeding with a Request for Information (RFI) process. This action will open to all vendors the opportunity to respond to the Department’s requirements for a mobile learning program. Kindle Touch probably does not meet accessibility requirements. It’s really hard to sell the government anything that doesn’t. Kindle Keyboard at least has voice menus but that feature is missing on KT, so a sight-impaired person cannot operate it. But maybe this rejection is the push Amazon needs to restore that minimal amount of accessibility. For extra credit, they should add voice navigation (KT does have a microphone).